Trying something new today - you still get the giveaway, I don't have to do the work. We will see how well it works out! - Small but mighty, the HP 2133 Mini-Note PC gives you the freedom to be productive here, there, and everywhere. It's ideal for instructional use or general purpose business applications. Starting at 2.63 pounds and only 1.05 inches thin, the HP 2133 is designed to go where you go without weighing you down. Don't be fooled by its size; this small wonder keeps you ultra-productive. It comes equipped with the tools to help you conduct business efficiently on the go with features such as high-resolution, 8.9-inch diagonal WXGA display, 92% full-size QWERTY keyboard and touchpad. The simple, refined design and all-aluminum case makes it sleek, sturdy and lightweight. 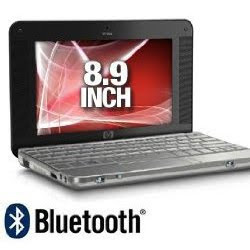 Features such as HP DuraKeys, magnesium alloy support structure, and HP 3D DriveGuard make a durable mini-note PC that can go the distance. Contest is open to US & Canada - ends Sept 30/09. You can enter this contest once every day. For this contest only, you need to click on the link below and enter the contest there. Comments left on this blog post will not enter you into this contest. 1) Employees of Frugal Freebies http://www.frugal-freebies.com and WinPrizesOnline.com (Create-a-sweepstakes) and all companies involved in this sweepstakes, or their families and agents, may not enter. 2) No purchase required in order to enter this sweepstakes. 3) Only one entry per day per person. 4) You are not allowed to use any automatically entry systems or entry tools to enter this sweepstakes. 5) The editor’s decision is final and no correspondence will be entered into over the results. 6) WinPrizesOnline reserves the right to substitute a prize with cash. 7) The closing date for entries is the last day of the month (Monthly draw). Winners are contacted by e-mail. 8) All correct and valid entries are entered into the random prize draw and winners are picked after the closing date. 9) This is an US & Canada only sweepstakes. Void where prohibited. 10) Prize are sponsored by winprizesonline.com and this Sweepstakes is offered in conjunction with multiple companies ("Promoters") through different websites ("Creative Presentations"). One (1) winner will be selected by the Create-a-Sweepstakes Team in a random drawing from among all entries received across all Creative Presentations. Prize will be fulfilled 8-10 weeks after winner confirmation. ◊ Don't miss our Weekly Giveaway from Frugal Freebies - You have to enter to win! ◊ Still Reading Commercial Emails For Free? Receive Emails That Interests You And Get Paid For It! Get $10 Just to signup! ◊ Want to save money while shopping online? Get cash back at over 1,000 stores! Plus get a $5.00 sign-up bonus! Free membership. My son just started high school and could really use this!!! My fingers are crossed for this one - he wants one of these so badly. I could really use this for my online courses when I am on my break at work to get caught up in class. I already have big plans for this..and I'm the envy of the neighborhood. My son just started high school and I've been trying to come up with ways to buy him a laptop for Christmas. It sure would make things easier to win one. I could really use this for my online courses, when I am on my break at work to get caught up in classes. I would love to win this for college. I am currently attending two colleges and working a part time job this would help me out a lot on all my school work!